We found Rickshaw Bags on Instagram (Words on the Goods is here, by the way). And it turns out there are other sweet options for covering and carrying your notebooks in addition to leather! 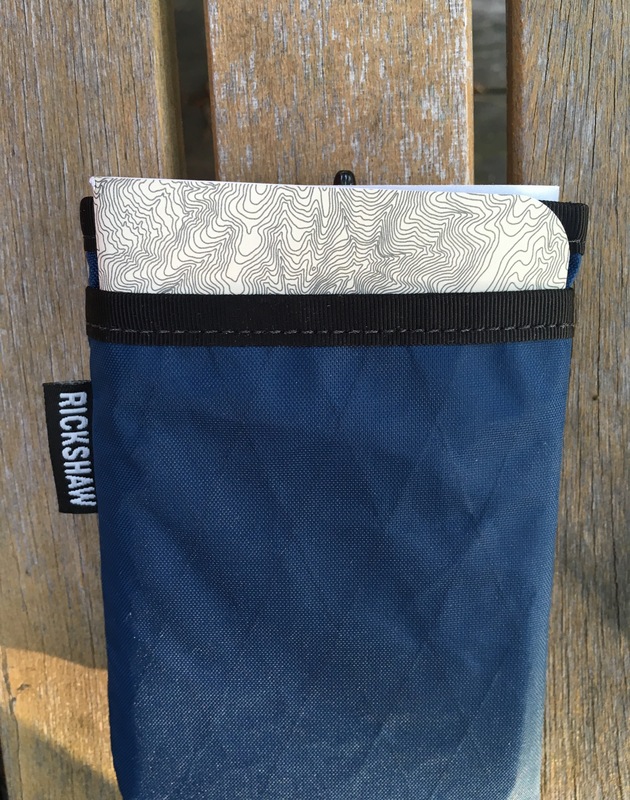 Rickshaw has just announced a Pocket Journal Sleeve, priced affordably at $29. They were kind to send Words on the Goods the two different styles of sleeve for review. So here we go! Fit Another Notebook in the Back Pocket! Fitting three pens (even bigger ones) is no problem. 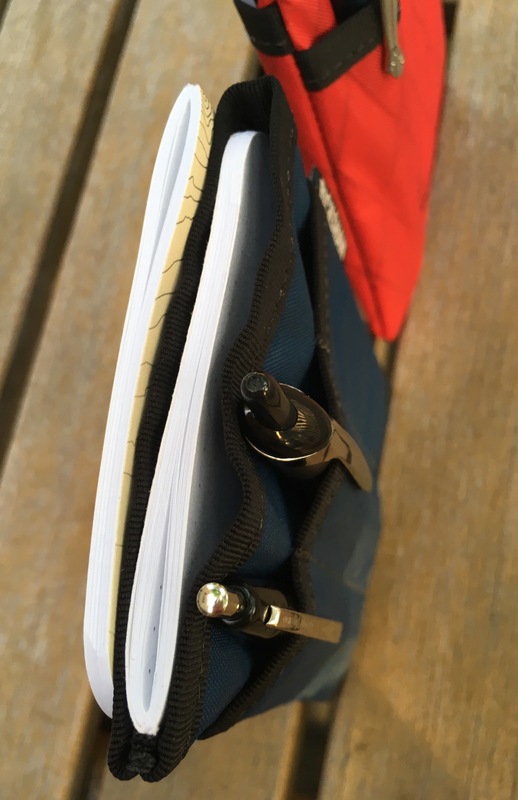 A pocket notebook goes in the middle pocket, and another one easily fits in the back pocket. The stitching is precise and the fabric is high-quality. This sleeve is super light, too. Carrying it around is fun. X-Pac™ is technical sailcloth that we’ve repurposed for our bags. It’s our most lightweight, and waterproof fabric. It will break in over time giving it a slightly wrinkled look but maintains its water resistance. Extremely durable, the diamond pattern is created by cross-tension fibers that act as ripstop and strength reinforcement. You could easily purpose the sleeve to hold an iPhone if you were so inclined. I even had lip balm in there for a little while, before I got paranoid about having it smear everywhere. So you can configure it however you want. It’s not very big, but you can probably squeeze your whole EDC in here! Rickshaw also had the smart idea to include a hard plastic insert, into which your cards go. This serves two useful purposes: (1) it makes it easier to get your cards in and out and (2) it keeps things stiff. A nice touch! This is just about the least expensive all-in-one notebook carrying option I’m aware of, so check it out here. In addition to the blue and red colors (in each style), there is black, grey, yellow, storm orange, olive, “lite-skin grey,” and some camo options. Rickshaw Bags are made in the USA, right in San Francisco. You can see more of their “Fresh Bags Made Daily” here. 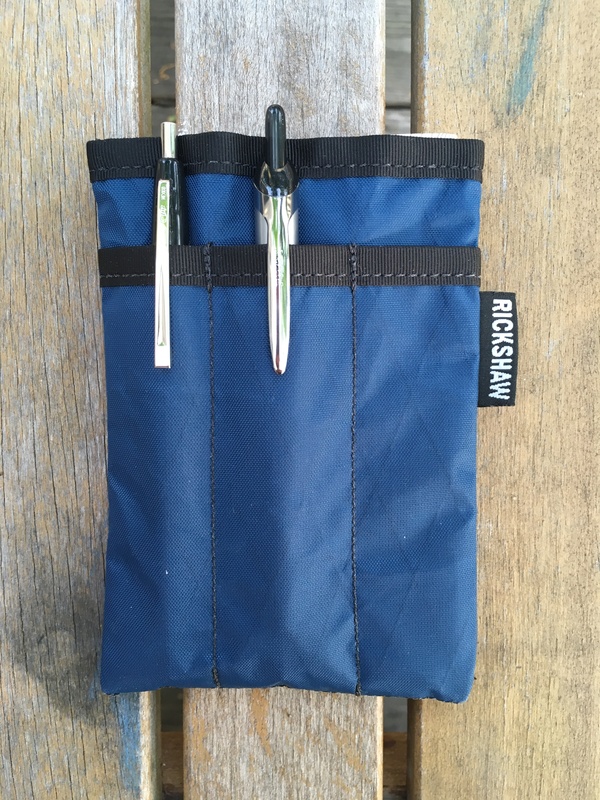 Thanks to Rickshaw Bags for the review samples!